How Many Hours Should A Salaried Employee Work? I’m an HR Manager in a new job and I am running into a sticky issue. In my new company different departments arrive and leave the office at different times. The official business hours are 9 a.m. to 5 p.m. but some people come in at 10 or 11 a.m. (or 6 or 7). I think the flexibility is fantastic. I work from about 8:30 a.m. to about 6 p.m. most days but once I go home after the workday, I don’t check email at night. I only respond to emergency texts and phone calls and so far I haven’t had any of those. A few of our managers have complained to me about the wide variations in working hours. Some of our managers love the freedom to customize their teammates’ working hours and some of them are aghast. They feel that everybody should work the same hours or at least that everybody should work at least nine hours a day. Evidently a rift between the old-school, “tough” managers and the free-wheeling “soft” managers has been building for some time. I was brought in to the company to shift the culture away from the old-school thinking but it can be hard. There is still an expectation among a number of our managers that a salaried person’s workday is well over eight hours. Our “tough” managers’ employees are the last to go home. This cultural variation across the department hasn’t led anyone to quit since I got here but I have had complaints from several employees. I tell our managers that if they overwork their employees, the employees will leave. However, my “tough” managers want me to force the “soft” managers to require more hours from their salaried employees! Obviously I’m not going to do that. Thanks Liz! You are my HR guru. Expectations are a huge part of any organization’s culture. It is a good use of managerial time for you all to sit down and hash out what your expectations are. Mother Nature is the ultimate teacher. If you overwork your employees, as you know, they will leave. The most marketable people will leave first. If you, your CEO and the other leaders in your company don’t want to see that happen, then your assignment is to sell your “tough” managers on easing up on their employees. Working people for longer hours doesn’t make them more productive, and causes enormous problems with fatigue, quality and the trust between your teammates and their leaders. If your managers haven’t designed jobs that can be completed in a normal workday, that’s what they need to learn. You can help them — but they have to own their piece of the problem before that can happen. You have to sell your managers on the idea of relaxing the work hours. If you use fear to force your “tough” managers to let their employees go home at five o’clock, you will not have accomplished anything. You can force people to do what you want, but that’s not buy-in. Instead, encourage your managers to sit down with their teammates and talk about working hours. Get that conversation going in every department. There are few conversations more important to have than that one! 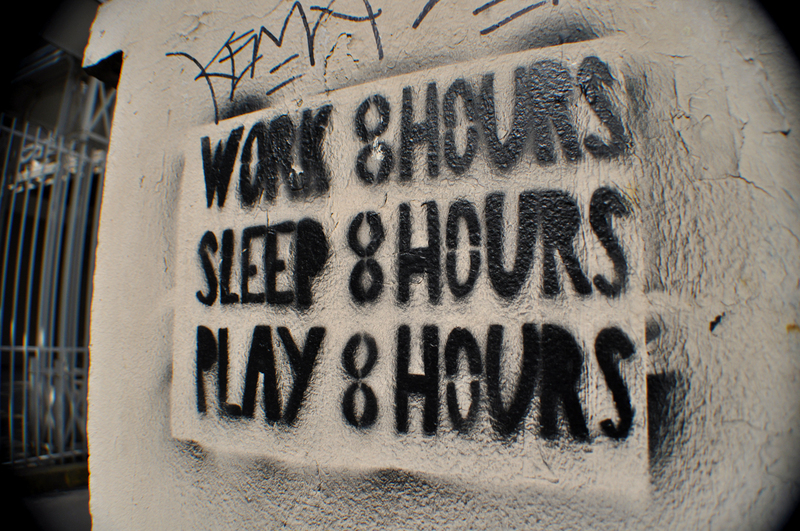 When people ask me how many hours a salaried person should work, I say “As many hours as it takes to do the job, up to about 45 hours per week.” If the job takes fifty-five or sixty hours a week to perform, then the job is badly designed. It’s not sustainable. If most people can perform a job in forty hours and a few people can get the work done in twenty-five hours, let them do it. Be happy you hired them! Our goal as leaders is not to get as much work as possible out of our employees. They are not cows to be milked. They are either genius value creators or we are lousy managers! When you find a genius value creator, you don’t load them up with extra tasks just because you can. As a manager you have less control than you think, because people can leave your department if they want to, or just stop trying. You can’t force them to care, or compel them to innovate or collaborate. All of those good things emerge organically when you create a healthy work environment, and are almost impossible to achieve when you don’t. When people are into their jobs, you don’t have to worry about their working hours. White-collar work is portable. It moves around wherever you go. You carry it in your head. You can’t keep it out! You think about your to-do list when you’re lying in bed and when you’re in line at the grocery store. Forty hours in the office is plenty. If you know certain departments are keeping their employees at their desks through the application of force (which is fear) your job is to gently educate those “tough” managers about the damage they are doing to your brand and your culture. You won’t be the bossy HR guy but rather their trusted adviser as you undertake that project. Everybody needs a sympathetic ear — and the more fearful someone is, the more they need you! The trick is to educate your managers without using force to do it. That’s where your brilliant listening, coaching and selling skills will come in. The conversation you inspire among your employees will also help shift your culture. When you make it okay to talk openly about workload, hours and expectations, you open up the energy in your shop. Every employee deserves a say in the discussion. It is not up to managers to decide that salaried employees must work a certain number of hours per week. If that decision is left up to managers rather than your salaried, Knowledge Worker employees themselves, then fear has become your principal motivator, and that’s the opposite of what you want. You will do brilliantly stepping into the sticky subject “When can our employees go home at the end of the day?” and you and your teammates will grow in the process. This is how fearless HR leaders are born! ← The Story behind Jobficient – Job search automation is the way to go!